Terror accused Damien Duffy will be asking for compassionate bail to attend his daughter’s christening, a court heard on Friday. A defence solicitor asked for the case against him to be adjourned for a week, telling Craigavon Magistrates Court he would be lodging the necessary paper work to apply for his temporary release from jail. Duffy, 46, from Westclare Court in Dungannon, Co Tyrone appeared at the court via video link from Maghaberry prison where he faces a charge of preparation of terrorist acts, namely targeting a former member of the security forces, on September 2 last year. Facing the same offence are Lurgan men Ciaran Magee, 24, from Lake Street and Shea Reynolds, 22, from the Kilwilkie Road. A fourth man, Luke O’Neill, 22, from Silverwood Green also in Lurgan, is accused of attempting to murder police officers between August 30 and September 2 last year as well as possession of explosives with intent to endanger life. The men were arrested after a large-scale security operation during which police recovered a fully-prepared, explosively-formed projectile that was ready for deployment. 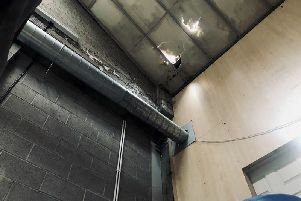 During a previous unsuccessful bail application for Magee, a detective constable claimed he was “a member of an active IRA unit,” outlining to the court how police received information that a rucksack had been moved from the site of a former factory in Lurgan. Surveillance was carried out on what he described as “an active service unit of the IRA,” claiming that Magee was in a car with one of the other members of the unit. A hidden camera had been placed near the home of a former police officer and there were a number of deleted images on a storage card but the PSNI do not know the whereabouts of the camera, the court heard. The officer said police objected to bail because of the possibility of re-offending as this offence had allegedly committed while Magee was on bail for riot. He claimed Magee was a member of an active service unit of the IRA and this was considered a threat to national security. Remanding all four back into custody, District Judge Bernie Kelly listed Duffy’s compassionate bail application next week and the rest to appear again in a month.